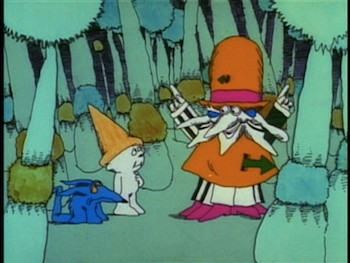 The 1971 animated special The Point was based on an album by singer/songwriter Harry Nilsson. The record told the same basic outline that became the movie, a concept that Nilsson allegedly concocted on acid, and in the original recorded version, he sang all the songs and laid down spoken word bits over music to relay the story. 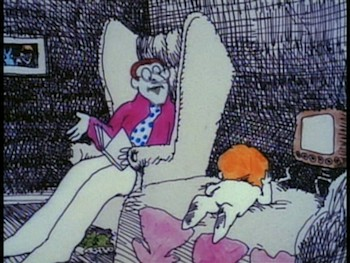 For the cartoon version, actors were brought in to cover the different parts, and extended dialogue sequences and a framing device were written to flesh out the material. 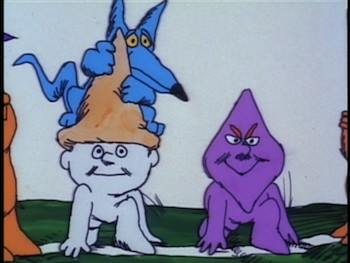 The Point was directed by Fred Wolf and animated by the Murakami-Wolf production company, a regular mainstay of Saturday morning cartoons and also the team that would later adapt Peter, Paul & Mary's "Puff the Magic Dragon" in much the same way. The end result is stylistically crude, but charming, aiming just a tad over little kids' heads to appeal to more adult pop culture junkies. 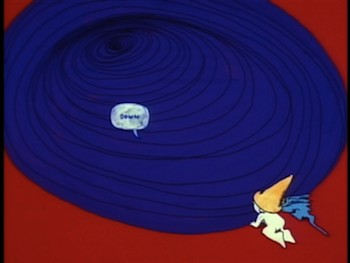 Though lacking any real overt drug references, The Point definitely has some groovy overtones, not entirely dissimilar to Yellow Submarine in its surreal visual approach, and it's a tame kind of precursor to Ralph Bakshi. The Point tells the story of the Land of Point, a fairy tale kingdom where everyone is born with a pointed head. Structures are cone-shaped, and angles are preferred to curves. Born into this kingdom is a boy named Oblio (voiced by Mike Lookinland, a.k.a. Bobby Brady). Oblio is an anomaly in that he has a round head. When another boy decides he doesn't like having a round-headed kid in his school, he gets his dad, a villainous count with influence in the King's court, to invoke a law that says all men should "have a point." Oblio and his dog Arrow are banished to the Pointless Forest, and most of the 74-minute feature is given over to their journey through this new terrain. There the duo meets a bunch of odd creatures, including a man made out of rock and a three-headed jester with an abundance of points. By the time Oblio comes out the other side, he learns that an individual's point is not in how he looks, but in how he acts and what he believes. A bit of a holdover from the 1960s, The Point's all you need is love message still has potency, even if some of its underlying "radicalism" no longer seems all that radical. Hell, it even tries to critique TV for rotting kids' brains while being a television program for kids. Was that progressive even back then, or was it already passé? I'd wager how much you enjoy this new edition of The Point will be directly proportional to the level of nostalgia is inspires. I can't recall ever seeing the program in its entirety prior to this, and my attraction to it was more for the Harry Nilsson connection than anything else. I thought the cartoon was cute, if inoffensive and not entirely memorable. I laughed more at the pug in the room with me who kept getting pissed off anytime Arrow got more talkative. If it came down to it, I'd opt to listen to the album on Spotify before I'd reach for my The Point: Definitive Collector's Edition DVD again, but the overall presentation here is really good and it makes for a nice entry in both my animation and music collections. According to IMDB, The Point was originally recorded on 35mm and was framed at the 1.33:1 aspect ratio that was the standard for broadcast television up until the mid-90s. The version shown on The Point: Definitive Collector's Edition is anamorphic, so on my widescreen television, it appeared in widescreen, and I am not sure exactly where the extra visual information came from, but it doesn't appear to have been tampered with. The screengrabs you see here are from my computer monitor, and the program I used to watch the disc went to a default that looks more in line with the expected full-frame appearance. The source material used for this disc was in excellent shape, so colors look vibrant, and the overall image quality is clean and clear. Resolution is sharp with no obvious instances of pixilation or jaggedness. A basic audio mix handles the material nicely. The recording has held up well, and it sounds clear and fresh with no distortion or glitches. Only one audio option is available, none of the alternate narration tracks are provided. Which makes this edition seem less than Definitive. There are four featurettes clocking it at 26 minutes altogether, or you can jump in at the different points where the documentary is broken up. Interestingly enough, if my eye doesn't deceive me, it appears that a lot of this material was whittled from the longer theatrical documentary, Who is Harry Nilsson (And Why Is Everyone Talkin' About Him?) but honed down for to particularly focus on The Point. The first part "Who is Harry Nilsson?" does a pretty good job of answering the question in a swift fashion. 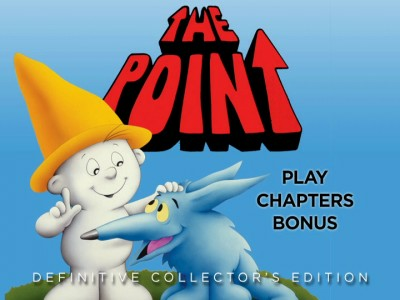 The second and third parts are similarly self-explanatory: "Pitching The Point" and "Making The Point" cover the development of the concept and how it eventually made its way to TV. "Legacy of The Point" talks about the continued love for the cartoon special, but is a fairly shallow assessment of The Point's ongoing influence or impact, if indeed it has any. Some of the reverence seems like a stretch. For instance, I don't think it's significant that the The Point predates the Coneheads, that's not a particularly good example of Nilsson being ahead of his time. Rent It. A curiosity from 1970s television, The Point has a lot going for it historically: it was the first feature-length animation produced for TV, it's based on a Harry Nilsson album, and Beatles fans will recognize the voice of Ringo Starr, who plays the narrator. That said, The Point maybe isn't the best blind buy. Younger kids will be fascinated by the cool visuals, and the story plays on a very basic level that they can enjoy, but your older kids might find the aesthetic a bit weird or the story too simplistic. For adults, it's no easy bet either. You may think you're going to really like it, the way I thought I'd really like it, but then end up as nonplussed as I was. It's not weird enough or kitschy enough or psychedelic enough or anything enough to knock your socks off unless you already have pretty strong memories built in.